On March 15th you have the opportunity to participate in this year’s second Smart City Hub, where innovative Smart City ideas are generated and new contacts are created across students, businesses, researchers and municipalities. Come and help us develop the good Smart City solutions that make the City of Knowledge more attractive and sustainable for all of us. ‘Smart City Hub’ is a physical platform that creates collaboration, meetings and solutions across students, businesses, researchers and municipalities, all working with urban planning, innovation, data and soft- & hardware on a technical and/or at business level. Each hub will be facilitated by experts and a relevant Smart City-theme such as supply, buildings, planning or mobility will be discussed as a theme at the hub. 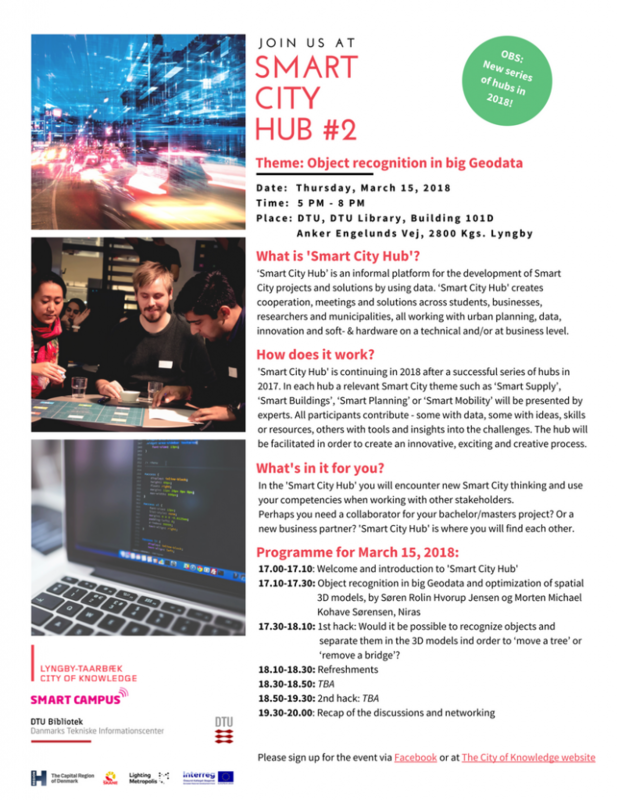 Smart City Hub #2 will take place on March 15th from 5-8 PM at DTU Library.